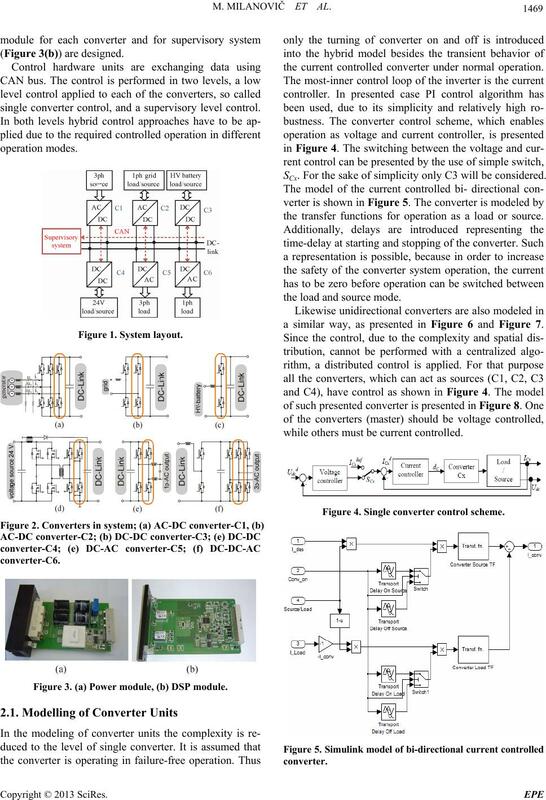 design of supervisory control algorithms. which in our case are PCs. perimental and afterwards numerical (simulation) ones. give some ideas for the future work. single converter control, and a supervisory level control. Figure 3. (a) Power module, (b) DSP module. the current controlled converter under normal operation. SCx. For the sake of simplicity only C3 will be considered. the transfer functions for operation as a load or source. the load and source mode. a similar way, as presented in Figure 6 and Figure 7.
while others must be current controlled. Figure 4. Single converter control scheme. Figure 6. Model of uni-directional (pure source) converter. Figure 7. 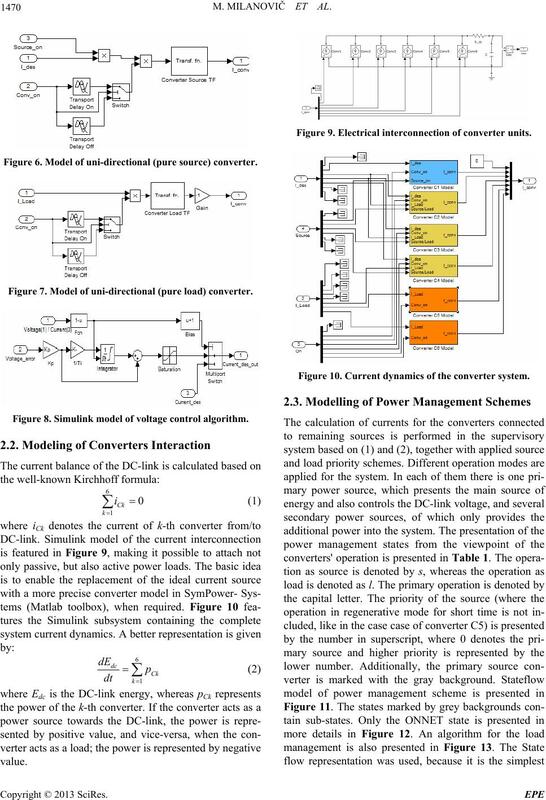 Model of uni-directional (pure load) converter. Figure 8. 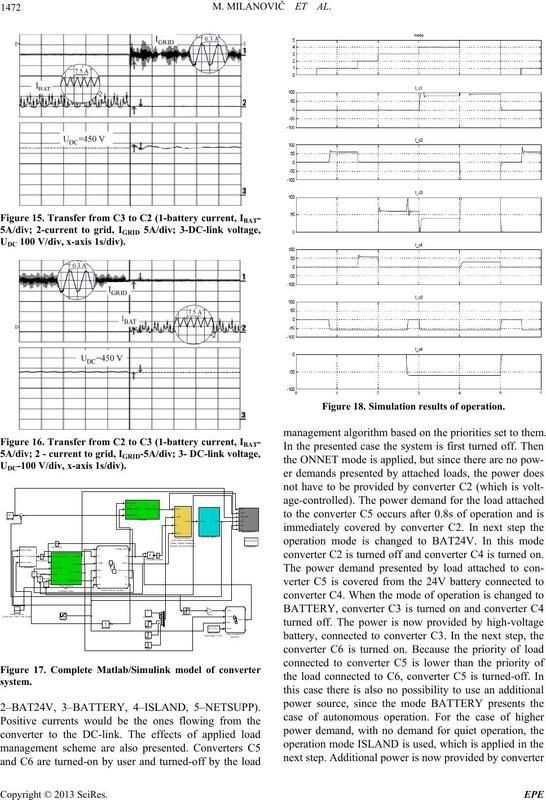 Simulink model of voltage control algorithm. Figure 9. Electrical interconnection of converter units. Figure 10. Current dynamics of the converter system. Table 1. Power Management States – Converter Roles. Figure 13. Algorithm for the load management. 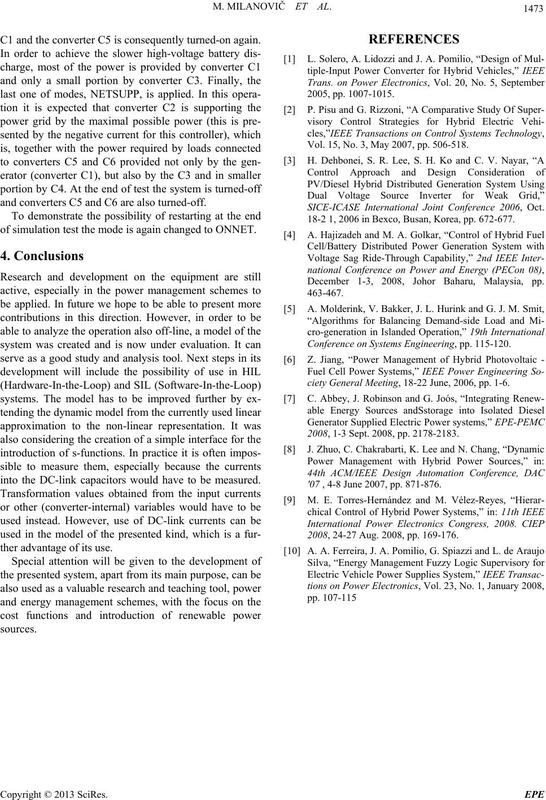 ture use of the converter system model. the system more useful for the experimenting purposes. Figure 14. Functional prototype of the system. UDC 100 V/div, x-axis 1s/div). Figure 18. Simulation results of operation. management algorithm based on the priorities set to them. converter C2 is turned off and converter C4 is turned on. C1 and the converter C5 is consequently turned-on again. and converters C5 and C6 are also turned-off. 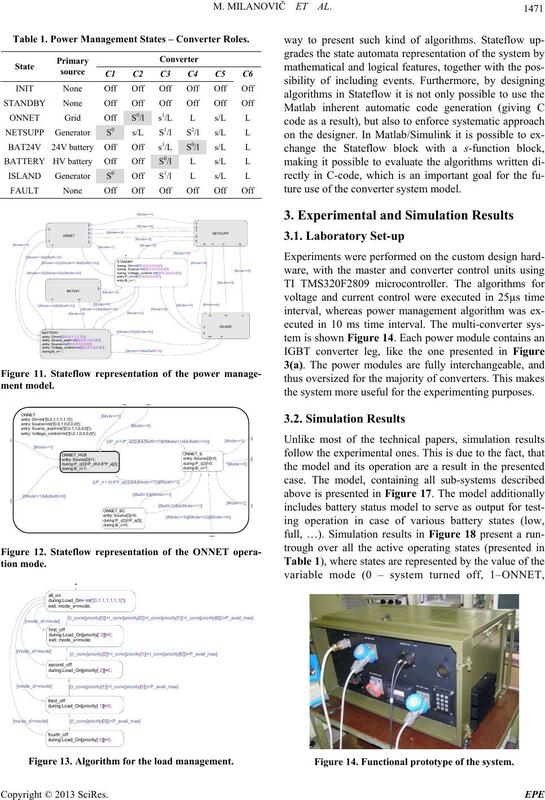 of simulation test the mode is again changed to ONNET. into the DC-link capacitors would have to be measured. ther advantage of its use. Vol. 15, No. 3, May 2007, pp. 506-518. SICE-ICASE International Joint Conference 2006, Oct.
18-2 1, 2006 in Bexco, Busan, Korea, pp. 672-677. December 1-3, 2008, Johor Baharu, Malaysia, pp. 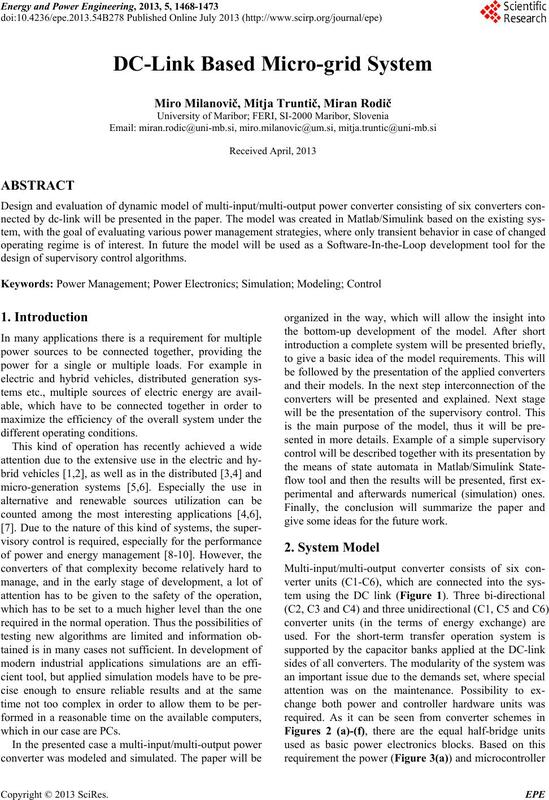 Conference on Systems Engineering, pp. 115-120.
ciety General Meeting, 18-22 June, 2006, pp. 1-6. 2008, 1-3 Sept. 2008, pp. 2178-2183. '07 , 4-8 June 2007, pp. 871-876. 2008, 24-27 Aug. 2008, pp. 169-176.